They are the ones without whom the Kagyu Monlam might not happen, or at least, not happen as smoothly as we usually take for granted it will. They help with everything from cleaning and bowl washing to kitchen duty and alms distribution. They are there as seating wardens, technicians, translators, photographers and reporters. They are the Gurusevakas - “those who offer their service to the Teacher,” in Sanskrit - around 300 of them during this 35th Kagyu Monlam. 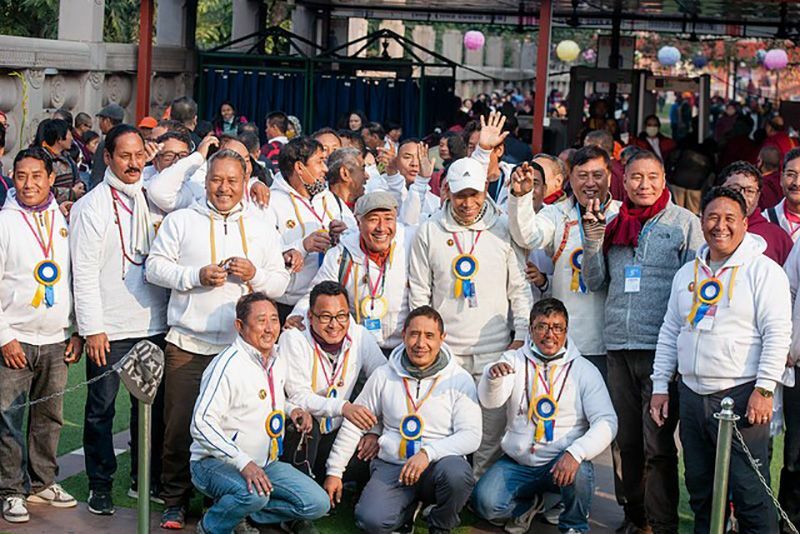 They are not the only ones, but the Gurusevakas are special in that they are all truly volunteers, giving of their time and energy in order to help the accomplishment, year after year, of the great tent of auspiciousness that is the Kagyu Monlam. They do get one sure moment of limelight, when they meet in audience with the Karmapa (and, this year, with Gyaltsap Rinpoche) halfway through the Monlam. Their work goes on all day long, and for some of the teams - for instance, those making the arrangements on the stage and around it for the next day’s events - sometimes into the wee hours of the morning, too. 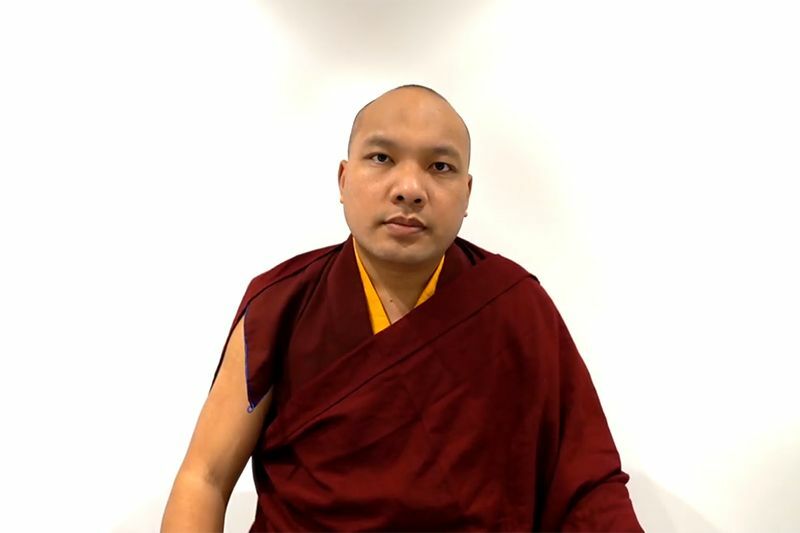 Indeed, the Karmapa, in his video message to the Gurusevakas during this year's audience, praised them for the hard work they had been putting in day and night. Coordinating their work are the team leaders, who together with other senior volunteers and the khenpos, Rinpoches and principal teachers, make up the Working Team. They communicate directly with the Karmapa, receive his instructions, and report on the facts on the ground. 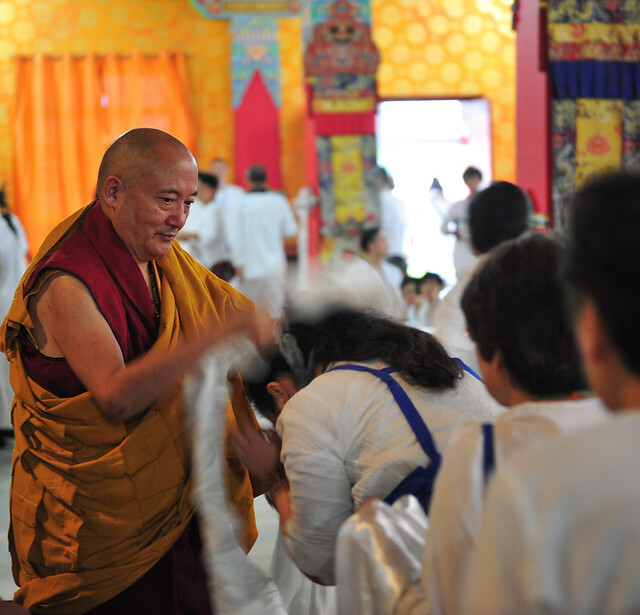 The Working Team is made up of only around 70 people, but they have all been working with the Karmapa for a long time. 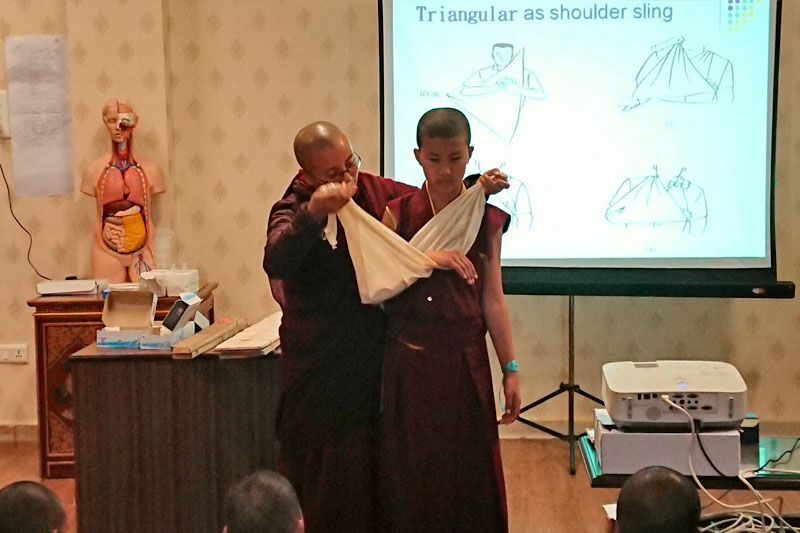 Yet another category of “service offerers” in the Kagyu Monlam, who operate quite separately from the Gurusevakas, are the Dharmapalas - “the protectors of the Teachings” in Sanskrit. This is a term perhaps more familiar to students of Vajrayana as designating a class of powerful beings subjugated into offering aid and protection to Buddhism and Buddhists. The Dharmapalas in the Kagyu Monlam do fulfill a similar role, being in charge of security, most visibly at the screening facilities at the entrance to the Kagyu Monlam Complex, but inside the Complex as well. We feel very special to be working under His Holiness the Gyalwang Karmapa.We feel his blessing. We get to meet so many different people, from so many different countries. It's a great opportunity for us. All the Dharmapalas come from Suja Tibetan Children's Village School in Dharamshala. 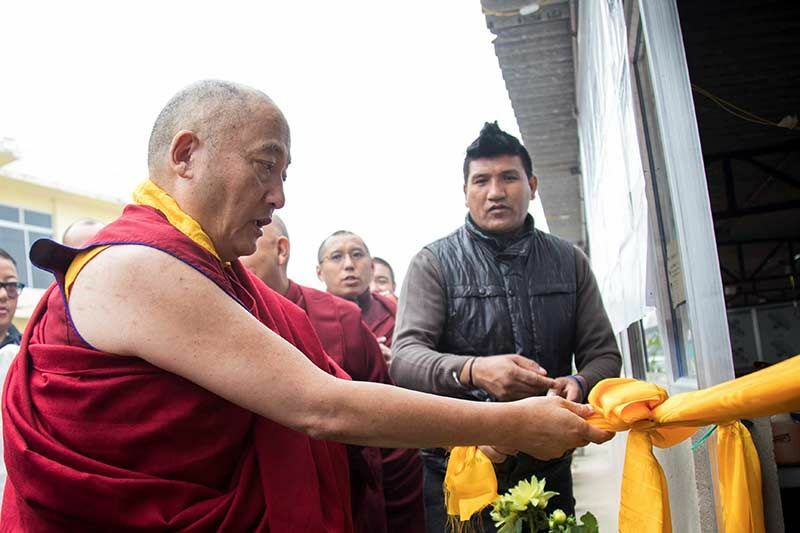 The TCV schools were originally established by the Dalai Lama's sister after their flight from Tibet, when she noticed the high mortality rates amongst children in the refugee camps. 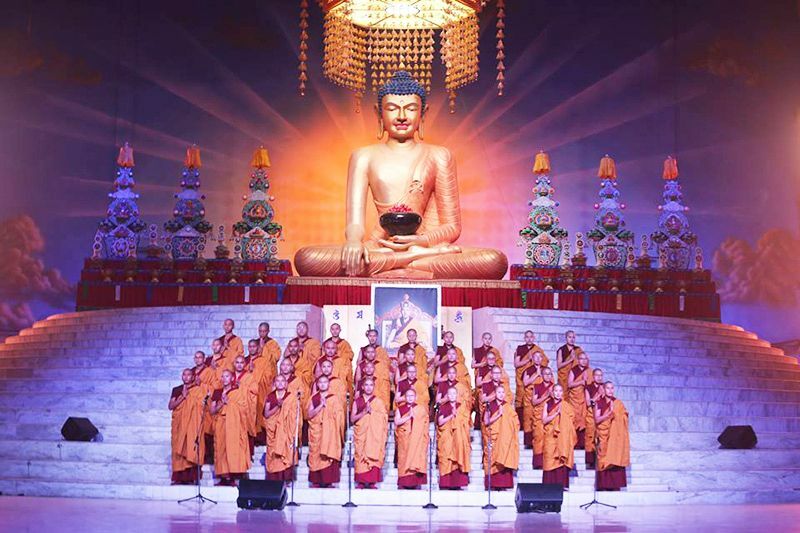 Both Gurusevakas and Dharmapalas are drawn from a variety of cultures and languages. The English-speaking reporter trying to build a picture of the Gurusevakas must therefore do with snatches at best: the Indian volunteer accountant whose wife is a Tibetan Buddhist and brought him to the Monlam; the Tibetan helper at the lunch service who has been doing it for 10 years and says the best part is getting to meet the Rinpoches and the Karmapa; the Spanish translators who have been practising Buddhism for 30 years in Huéscar and have finally found the motivation to come and make the personal connection to the Karmapa; the third-timer Dutch lady directing the queue for Gyaltsap Rinpoche’s audience in stunning fusion fashion, combining her sari with a Tibetan jacket. Helping people makes my inner soul happy. And I believe that serving is as much part of the Kagyu Monlam as praying.